A chemical peel is a technique used by an experienced esthetician to improve the appearance of the skin on the face, neck or hands. The procedure consists of a chemical solution being professionally applied to the skin. The chemical solution exfoliates dead skin cells and helps healthy skin cells rise to the surface. By removing the outer layers of the skin, chemical peels allow deeper layers of fresh, untouched skin to be revealed. There are a wide array of chemical peels available to meet varying skincare needs and treatment preferences. There are three categories of chemical peels: superficial/light, medium, and deep. It is important to note that the terminology for these categories is not agreed upon universally, so it is important to discuss variations with your esthetician, to ensure you understand the depth that the peel penetrates within the skin, as well as the amount and duration of peeling to be expected. Superficial/Light peels: These are the most gentle peels available. Alpha and beta hydroxy acid formulations are applied to penetrate only the outermost layer of skin, known as the epidermis. Superficial peels are primarily used to reduce clogged pores and blackheads, minimize the appearance of mild skin discoloration, and dry/flaky skin. Superficial peels do not hurt, and there is no down time or visible signs that you have had the treatment done. Superficial chemical peels, such as Jan Marini 2-Step Peel Systems and Obagi Blue Peel RADIANCE, improve overall complexion and provide firmer, smoother, brighter-looking skin. Medium peels: These peels penetrate deeper into the skin for more drastic results than light peels. Peels in this category, such as the Perfect Peel and Rejuvenia Peel, can be used to treat sun damage, hyperpigmentation, and fine lines. Medium peels have a longer peeling time and more side effects than superficial peels. The skin may become swollen and pink for a few days after the treatment, and there will be a greater amount of skin peeling off. Deep peels: Tricholoracetic acid or Phenol formulations are the strongest peels, and they penetrate the dermal layers of skin. This group of deeply penetrating chemical peels provides the most drastic results, erasing sun damage, scarring, deep lines and wrinkles, and hyperpigmentation. Deep peels take an average of 8-10 days for the peeling to complete. Skin will be red, swollen, and tender for up to two weeks. 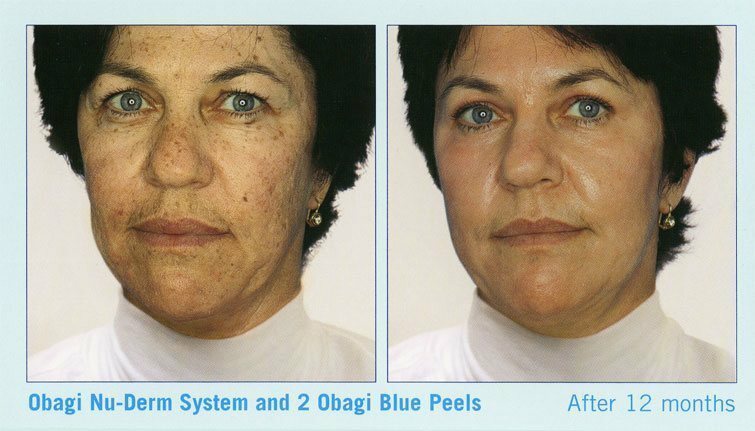 Peels like Obagi Blue Peel and The Perfect Peel are deep peels that provide amazing results and deliver smoother, tighter, more youthful looking skin.Chemical treatments are applied in-office, and the application process is generally very quick. The timeline for the peeling to complete varies on the type of chemical peel used. Call the Skin Klinic (480) 451-1700 to talk to one of our experienced estheticians who can help you determine which of our chemical peel treatments is right for you. Chemical treatments are applied in-office, and the application process is generally very quick. The timeline for the peeling to complete varies on the type of chemical peel used. Call the Skin Klinic (480) 451-1700 to talk to one of our experienced estheticians who can help you determine which of our chemical peel treatments is right for you.